Luxury in the wilderness is what you'll find at Wilderness Lodge. 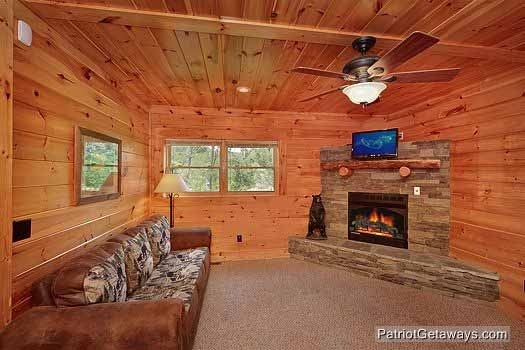 With two stone fireplaces, flat screen tv's, tons of covered porch space, pool table, whirlpool tubs, outdoor hot tub, and gourmet kitchen this cabin in the "wilderness" will please even the most discerning traveler. 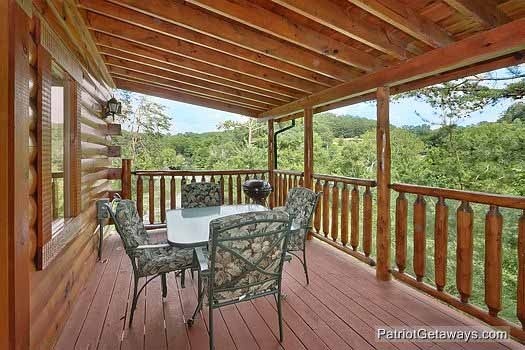 Located in off Goose Gap Road in a beautiful log cabin resort community, you'll be away in the mountains, but still close to town, and without any steep mountain roads to travel. 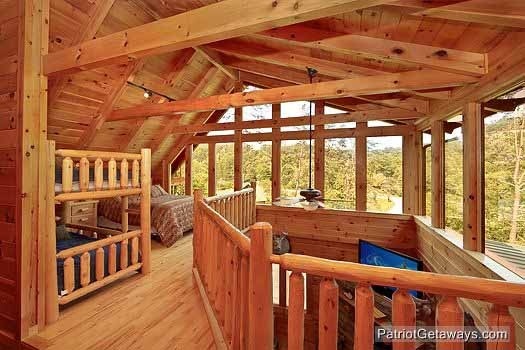 Inside Wilderness Lodge you'll find plenty of room for the wild things to roam too! 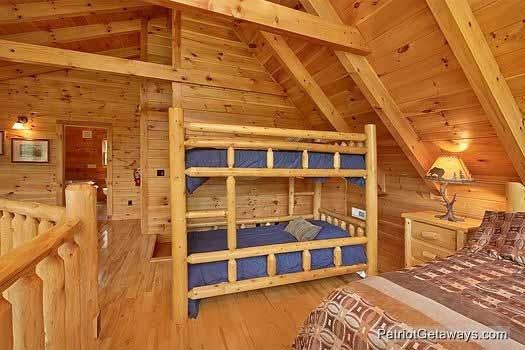 With three bedrooms and a fourth lofted bedroom the lodge comfortably sleeps up to 14 guests. 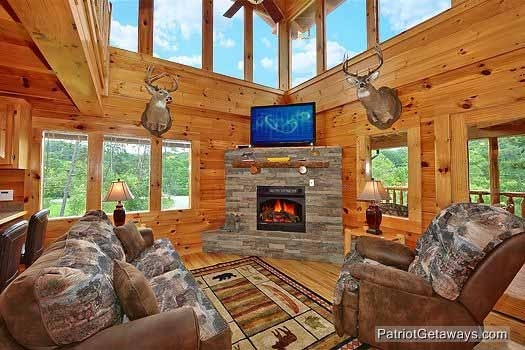 There are also two living areas including a game room with pool table, and a living room adorned with the homeowner's trophy game mounts, offering guests the real wilderness hunting lodge experience just a few miles from the Pigeon Forge attractions. 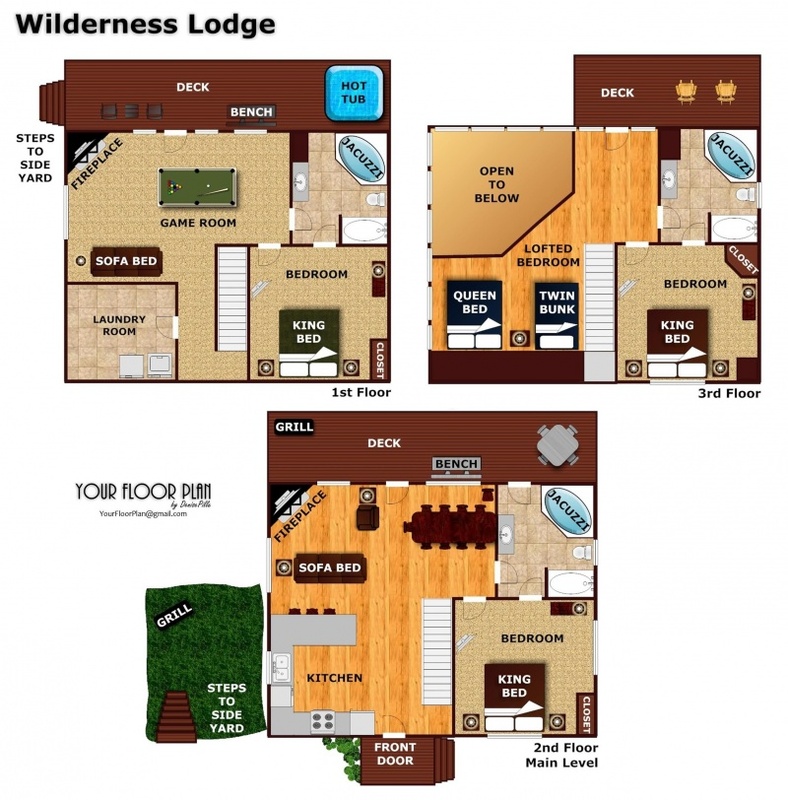 Call today to reserve Wilderness Lodge for your adventurers! 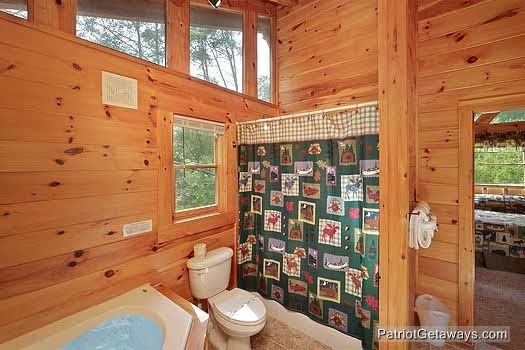 American Patriot Getaways is the first cabin that I have rented that furnished linens, paper towels, tissue, dishwashing liquid. That was such a big help and I will stick with APG from now own! Absolutely the BEST! Thank you so much! Re: Wilderness Lodge. 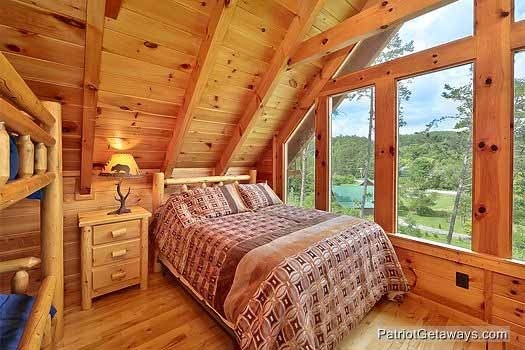 The cleanest cabin we've ever stayed in. From reservations thru check out, this was a great experience. 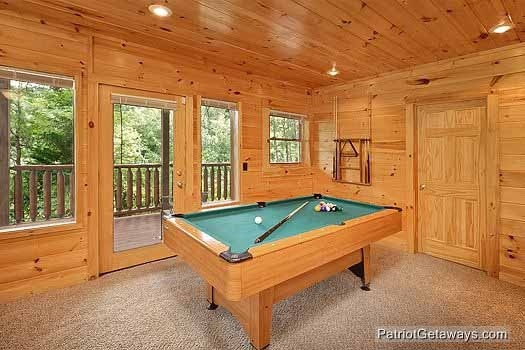 The only negative feedback I could give would be that the pool table is kind of wobbly and in need of a little repair. 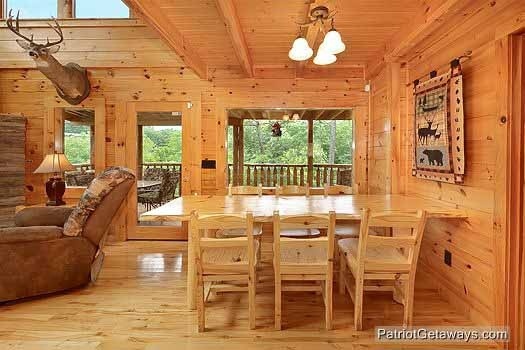 But we had a great time and would definitely recommend this cabin and American Patriot Getaways. This cabin was fabulous I would stay in again and recommend it highly there was nothing that we didn't like the staff was great..We look forward to coming back again would like to have something in warmer weather with a creek so the kids enjoy the outdoors..we were very happy and satisfied with this cabin..
We loved this cabin! Each family/couple stayed on a different floor but didn't have to hear each other. As a large extended family we travel to Gatlinburg/Pigeon Forge yearly. Wilderness Lodge was definitely one of the best cabins we have stayed in. We felt right at home in this cabin. It is in a great area. We experienced a problem with the clothes dryer. We placed a call to guest services and the problem was taken care of within 2 hrs. Just wanted to say this was one of the best cabins I have ever stayed in. This place made me feel right at home. One thing I could not get to work was the downstairs air unit but I was still comfortable. 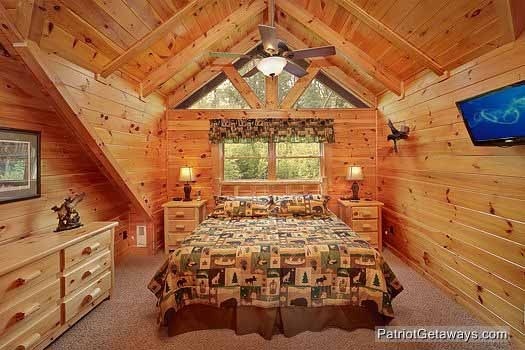 Loved this cabin!! FANTASTIC! 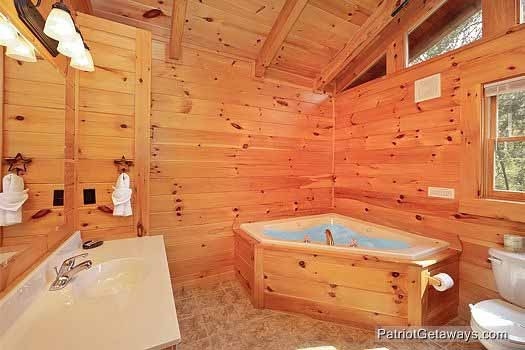 I have stayed with Patriot Getaways a few times, and this was the best of all. 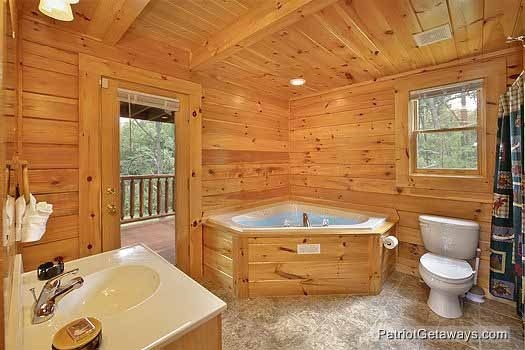 What an AWESOME CABIN and deal. ME, my Son, and 2 other buddies we work with, stayed 5 nights in Wilderness Lodge. 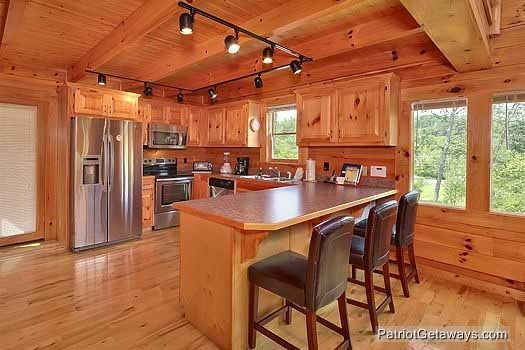 The inside was exceptional and very homely feeling.The kitchen and all the accessories are fantastic and up to date. 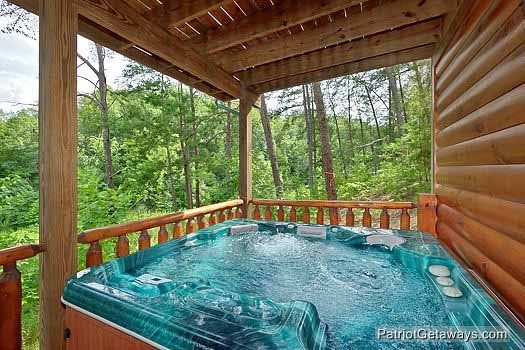 The balconies are all very comfortable with the outside furniture, hot tub, and charcoal grill. We cooked out all 5 nights and enjoyed the outside night air and quietness. We all agreed wewould make this trip again next year and are looking forward to it. 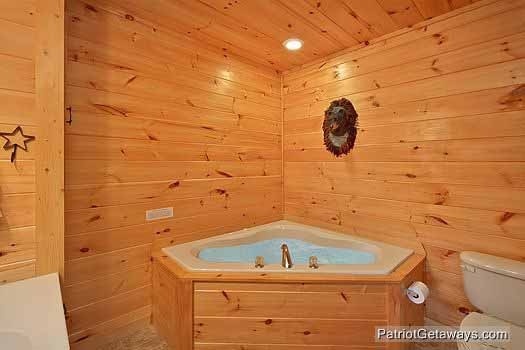 I would recommend this Cabin to anyone who likes pleasure and comfort. My husband and I have been renting from APG about once a year for the last 10 years or so and it has always been wonderful. 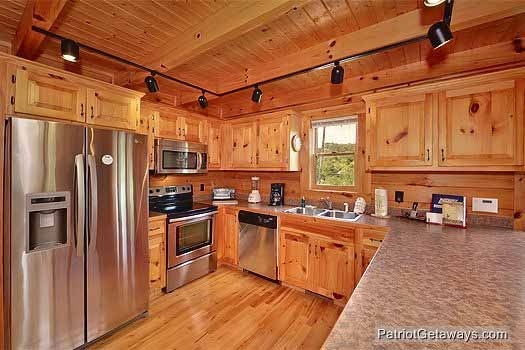 The cabins are outstanding and the staff is such a pleasure to work with. Already looking forward to our next visit. 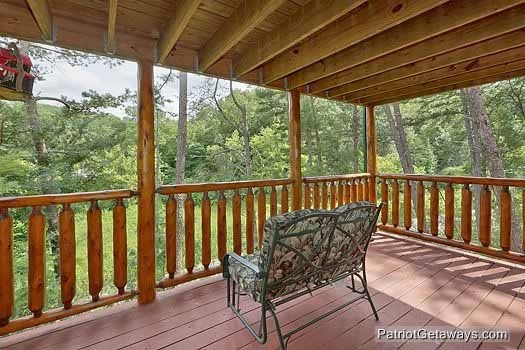 We have stayed in properties with American Patriot Getaways many times. We have always been satisfied with their service and their properties. We reported some minor maintenance issues when we departed, none of which caused a problem during our stay. APG done an outstanding job and this was our 2nd time renting from APG! The only suggestions I would make is the wireless internet service worked only on the bottom level and not on the main and top level! Therefore a better router would be nice. Besides that we had a wonderful time!! This was a great vacation and the cabin was awesome. The whole family thoroughly enjoyed our stay and will definitely stay again. 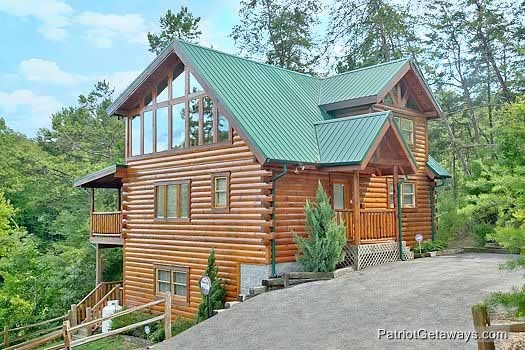 We rented this cabin for our daughter's 1st Birthday with both sets of grandparents. We all had a wonderful time and our daughter had a very enjoyable birthday. We have stayed with APG before and both times it has been a truly wonderful experience. We're already looking at coming back in the fall. 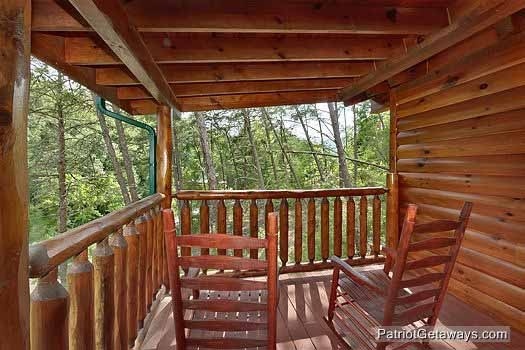 With only needing a 2 bedroom next time this cabin would be a little more than needed but definitely looking at the 2 bedrooms from APG (an eye already on a couple- just waiting for some deals hopefully). Thanks once again APG! Suggestion would be to put mirrors in the bedrooms over the dressers. Other than that everything was beautiful. 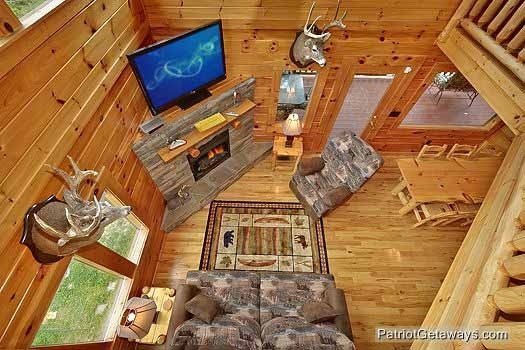 The cabin was set up very nicely. 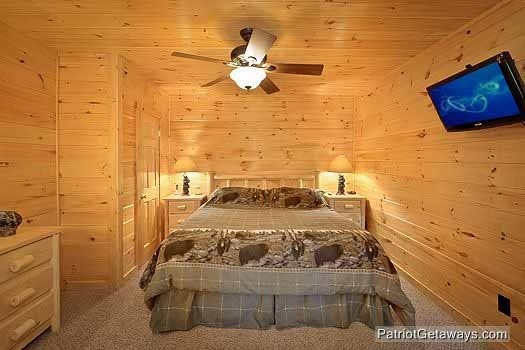 We have stayed in APG Cabins for about the last 10 years. There is none better. Period.